A multipurpose and successful website has multiple founding moments. Naturally, it’s hard work, in-depth strategic positioning and smart timing. What must be prioritized here is professional and practical functionality. Sadly, this point is oftentimes underestimated. Though the websites’ niches, designs and concepts are different, the main functionality is usually very common. Let’s revise the pieces and see how they fit into the bigger picture of creating a multipurpose website. So, the core need for building a multipurpose website is a page builder for creating all types of general content. Among popular builders, MotoPress Content editor is one of the topmost plugins for creating a trusted and powerful website. It’s all-in-one tool, which highly extends the functionality of your WordPress dashboard making a need to install hundreds of plugins (which are very often oriented on fulfilling just several certain functions) redundant. It’s optimized for different screen resolutions and compatible with all themes. The plugin was developed primarily focusing on beginner-friendliness, feature-rich functionality, reliability and last web design trends. It’ll help to bring your fashionable website design to the higher level in terms of functionality and will also give the somehow outdated websites a fresh look. You’ll be able to customize any types of content: text, graphics, buttons, video, galleries, maps and other numerous widgets. Each of them is supplied with its own list of settings. As you get deeper into the customization process, you are getting used to the editor very fast and then doing a lot of drag and drop work automatically. A good thing to help you concentrate more on content and less on routine process, isn’t it? You may be interested in viewing and playing around with the full set of features running the demo version of the content editor (click the red MotoPress Content Editor button upon login into the demo admin area). We are also happy to have a special educational video resource of how to go about structuring the essential elements of your future web pages with a help of the editor. Moreover, it’s much easier and cheaper to install this addon as an element of your Visual Page builderthan to search among various third-party plugins trying to find really professional and reliable one. MotoPress Google Maps Pro Addon is more functional and creative version of the default Google maps to make the maps on your site stand out. Adding this addon to your Content editor you are able to manage unlimited number of custom icons and adjust their type, color, size, write tooltips, add media data or any other extra info, etc. Discover more options and check how to apply hundreds of custom styles, set custom markers, etc. directly on the addon’s page. MotoPress Image Hotspot addon is one more lightweight addon to be added to the Content Editor. The module generates animated pointers with tooltips that can be put over the needed image or any part of the image. It’s functioning as simple as tagging your friends on Facebook. It’s really multipurpose option to detail your images with short titles, descriptions, additional characteristics, instructions, guides, etc. Installing this addon, you can manage to change the role of you images from only visual attractiveness to more meaningful resource. People love to see you try to make your visual presence more informative. For some websites and blogs like travel agencies, culinary resources, diverse blogs such addon is simply a must-have. A range of settings (like color, size, position) will be a good help in adjusting the hotspots according to the image or website design. If you sell products and services or going to launch a website, Countdown Pro addon would be a great tool to perform both tasks. The dynamic and precise countdown timer will be a much better way to get remembered and win the trust of your visitors by quite accurate notification of a launch date. As for the sales and promotions, the countdown timer creates a sense of urgency and makes your propositions more valuable. You definitely need it if you run an online store and regularly create promotions and discount the products. One more cool addon for advanced users is MotoPress White Label plugin allowing you to perform the re-branding program of MotoPress Content Editor, slider and future plugins. So, you’ll be free to modify and share the software without mentioning about the license and other update information. White labeling is a widely known solution to save your time and money if you are oriented on building a startup or making profit easily. It will set you back only $47. 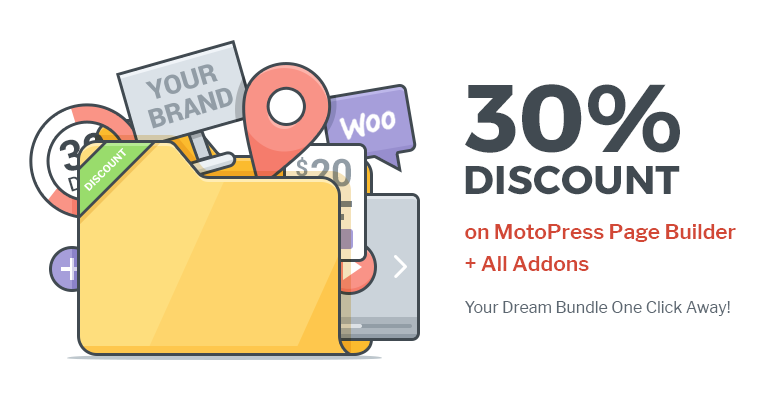 The MotoPress team also offers such essential option as WooCommerce and MotoPress Content editor integration for free to help you create an online store of any kind and any level without writing a line of code. One more awesome and popular plugin is responsive MotoPress Slider, which will help you to always keep the main branding messages in the spotlight. Many website owners understand that first impression is everything, that’s why so close attention is paid to creating a maximum attractive, trendy and clear website ‘image’ in all its senses. Often the different types of sliders effectively play this role. The MotoPress slider plugin is perfect for creating cool fast-loading slideshows, galleries and presentations with smooth transitions. Should we say that navigation through the admin tools is a breeze? The installation also is as easy as of any WordPress plugin. You can view one of the recent MotoPress posts featuring many live examples of the slider. It’s also vital to note the point of search engines optimization. You are probably aware that high SEO optimization of the WordPress CMS itself is a widespread myth as any CMS by its nature cannot be so, therefore, the additional SEO elements should be added to increase the site ranking. The plugins, themes, etc. can be SEO friendly if well-coded and set up correctly. The MotoPress plugins and addons presented in this post meet all the needed requirements of high SEO-optimization: they don’t conflict with other functionality and are regularly updated, so you should not worry about this. Hopefully, you found some useful ideas and resources here to build or improve your website in terms of multifunctionality. To sum up, using all the needed products among the listed above you are able to get high optimization and personalization of your website – 2 important factors to impress the site visitors and search engines robots as well. This Block Contains Unexpected or Invalid Content: How to Fix It in Gutenberg?